When the relic that holds all of the power for the Secret Society of Santa Clauses is stolen, they have no choice but to turn to their European ally turned adversary, Krampus, in order to restore the balance. The being that punished children is the only hope for those who want to bring cheer into the world in an comic that’s extremely fun and keeps a tight plot in amongst the jokes and puns. Total honesty time here: I almost didn’t give this one a shot. 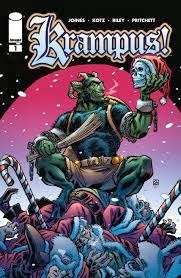 Any comic about Krampus not written by Benito Cereno* seemed wrong to me somehow. But I figured I’d see what it was about, and wow, I came away extremely impressed. While I’m unfamiliar with Joines, Kotz, and Riley, they come together here to show that we may be seeing the torch passed a bit when it comes to writing good comics that can make the reader laugh. Krampus starts off with an errand boy for the Santa Clauses trying to protect the remains of St. Nicholas and failing badly, attacked by a legion of Sugar Plumb Fairies. Later, we’re introduced to a hired gun who is zapped from the Old West because of a clerical error due to his name into the world of holidays. There’s also a killer Nutcracker and the very elements themselves jump into play. Each of these introductions are cleverly timed by Joines for maximum effect, combining the joke factor with a bit of menace in a story where the terror of children is turned into an unlikely gumshoe to gain his freedom. 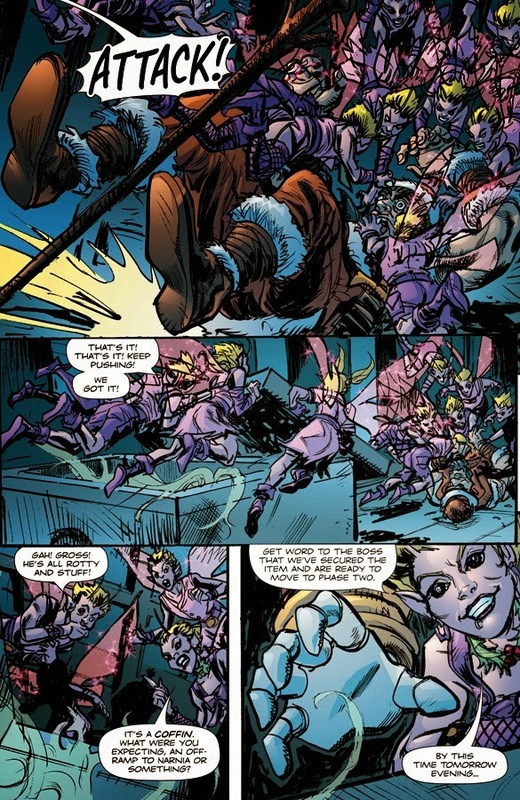 Comedy in comics is very hard to pull off, but Joines does a great job here, whether it’s working with the artists to create a variety of Santa Claus models that match their backgrounds or putting Krampus in ridiculous situations, like landing in the middle of a nightclub and watching him drolly comment on the bad behavior around him. The verbal gags are solid (more on that in a moment) but they wouldn’t work nearly as well if Kotz and Riley weren’t able to give them visuals to take them to the next level. A perfect example of this are the Sugar Plum Fairies, who are dressed like Tinkerbell met a 1950s street gang, all shaded pinkish purple by Riley and wearing sneers and menacing looks from Kotz. These terrifying but cute creatures banter about skinning Krampus while striking poses that are cut abruptly short when their first attempt at killing him fails badly. Krampus himself is done up like a gamma-irradiated Satyr with chains and a face that never seems happy. He talks a bit like Batroc ze Leaper from Marvel, which adds to the fun when he’s arguing with someone. There’s a ton of emotion on the faces of Kotz’ characters, with a lot of angular line work and expression. He reminds me a bit of Dan Jurgens mixed just a bit with the Buscemas due to the extra shading and linework. I love how his panels always feature action or implied movement. There’s never a dull moment in the panels, even when Santas are scheming or a minor character is helping to move the mystery along. Every once in a while, Kotz lets Krampus mug to the reader but it’s not annoying because it’s done sparingly, Looney Tunes style. He has a great sense of just what to focus on, moving the reader’s eye across the page. Meanwhile Riley’s colors change depending on the scene, giving us a strong sense of place. It’s a great artistic combo that does a better job with this lighthearted story than a lot of creators are doing on more high profile books. I can’t leave this review without mentioning Joines’ dialogue again, though. The way that he gives each Santa we meet a personality. The small moments of seriousness, such as when Krampus questions Old Man Winter’s son and he talks about wanting to be free, hitting on a theme of Krampus’ quest. It’s just so well done, taking this beyond a joke a minute book and giving it depth. There’s great timing on the jokes (“get ahead” when referencing stealing the corpse of St. Nicholas, for example, or the insults Krampus hurls at the unlikely cowboy hitman) but Joines also can take a moment and really register the pain behind a character’s eyes. 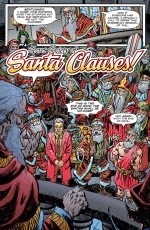 Krampus is an irreverent detective story playing in legend and myth with amazing jokes and art that’s top notch. It doesn’t get much better for me than that, making this one my sleeper hit so far in 2014. If you overlooked it so far, don’t keep making that mistake. Give this one a try. I’m betting if you match at all with my taste, you’ll dig it. Now it just needs a Cereno-based backup story, and we’d really be in business. No matter what, though, I’m looking forward to seeing the story of Krampus unfold. You should be, too. *For those not in the know, comics writer Benito Cereno is a fountain of mythological knowledge and often expounds upon the various stories and legends behind our favorite holidays on Twitter and Tumblr.